Another useful API implemented in ADAM is the RegionJoin API, which joins two genomic datasets that contain overlapping regions. This primitive is useful for a number of applications including variant calling (identifying all of the reads that overlap a candidate variant), coverage analysis (determining the coverage depth for each region in a reference), and INDEL realignment (identify INDELs aligned against a reference). There are two overlap join implementations available in ADAM: BroadcastRegionJoin and ShuffleRegionJoin. The result of a ShuffleRegionJoin is identical to the BroadcastRegionJoin, however they serve different purposes depending on the content of the two datasets. The ShuffleRegionJoin is a distributed sort-merge overlap join. To ensure that the data are appropriately colocated, we perform a copartition on the right dataset before the each node conducts the join locally. ShuffleRegionJoin should be used if the right dataset is too large to send to all nodes and both datasets have high cardinality. The BroadcastRegionJoin performs an overlap join by broadcasting a copy of the entire left dataset to each node. The BroadcastRegionJoin should be used when the right side of your join is small enough to be collected and broadcast out, and the larger side of the join is unsorted and the data are too large to be worth shuffling, the data are sufficiently skewed that it is hard to load balance, or you can tolerate unsorted output. Another important distinction between ShuffleRegionJoin and BroadcastRegionJoin is the join operations available in ADAM. Since the broadcast join does not co-partition the datasets and instead sends the full right table to all nodes, some joins (e.g. left/full outer joins) cannot be written as broadcast joins. See the table below for an exact list of what joins are available for each type of region join. Where dataset1 and dataset2 are GenomicRDDs. If you used the ADAMContext to read a genomic dataset into memory, this condition is met. A subset of these joins are depicted in Figure 2 below. To demonstrate how the RegionJoin APIs can be used to answer scientific questions, we will walk through three common queries that can be written using the RegionJoin API. First, we will perform a simple filter on genotypes based on a file of features. We will then demonstrate a join and group by on variants and features, providing variant data grouped by the feature they overlap. Finally, we will separate reads into those that overlap and those that do not overlap features from a feature file. These demonstrations illustrate the difference between calling ShuffleRegionJoin and BroadcastRegionJoin and provide example code to expand from. This query joins an RDD of Genotypes against an RDD of Features using an inner join. Because this is an inner join, records from either dataset that do not pair to the other are automatically dropped, providing the filter we are interested in. This query is useful for trying to identify genotypes that overlap features of interest. For example, if our feature file contains all the exonic regions of the genome, this query would extract all genotypes that fall in exonic regions. After the join, we can perform a transform function on the resulting RDD to manipulate it into providing the answer to our question. 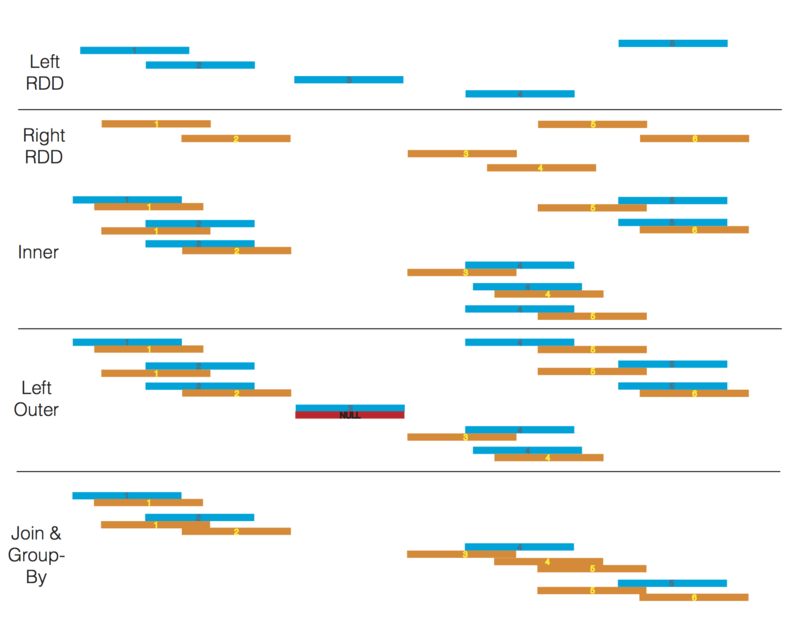 Since we were interested in the Genotypes that overlap a Feature, we map over the tuples and select just the Genotype. Since a broadcast join sends the left dataset to all executors, we chose to send the features dataset because feature data are usually smaller in size than genotypic data. This query joins an RDD of Variants against an RDD of Features, and immediately performs a group-by on the Feature. This produces an RDD whose elements are a tuple containing a Feature, and all of the Variants overlapping the Feature. This produces an RDD whose elements are tuples containing a Feature and all of the Variants overlapping the Feature.This query is useful for trying to identify annotated variants that may interact (identifying frameshift mutations within a transcript that may act as a pair to shift and then restore the reading frame) or as the start of a query that computes variant density over a set of genomic features. When we switch join strategies, we swap which dataset is on the left side of the join. BroadcastRegionJoin only supports grouping by the right dataset, and ShuffleRegionJoin supports only grouping by the left dataset. The reason BroadcastRegionJoin does not have a joinAndGroupByLeft implementation is due to the fact that the left dataset is broadcast to all nodes. Unlike shuffle joins, broadcast joins do not maintain a sort order invariant. Because of this, we would need to shuffle all data to a group-by on the left side of the dataset, and there is no opportunity to optimize by combining the join and group-by. This query joins an RDD of reads with an RDD of features using an outer join. The outer join will produce an RDD where each read is optionally mapped to a feature. If a given read does not overlap with any features provided, it is paired with a None. After we perform the join, we use a predicate to separate the reads into two RDDs. This query is useful for filtering out reads based on feature data. For example, identifying reads that overlap with ATAC-seq data to perform chromatin accessibility studies. It may be useful to separate the reads to perform distinct analyses on each resulting dataset. Because of the difference in how ShuffleRegionJoin and BroadcastRegionJoin are called, the predicate changes between them. It is not possible to call a leftOuterJoin using the BroadcastRegionJoin. As previously mentioned, the BroadcastRegionJoin broadcasts the left dataset, so a left outer join would require an additional shuffle phase. For an outer join, using a ShuffleRegionJoin will be cheaper if your reads are already sorted, however if the feature dataset is small and the reads are not sorted, the BroadcastRegionJoin call would likely be more performant.